Less than a year ago, traders watched in dumbfounded amazement as bitcoin soared every day as momentum chasers were hooked. 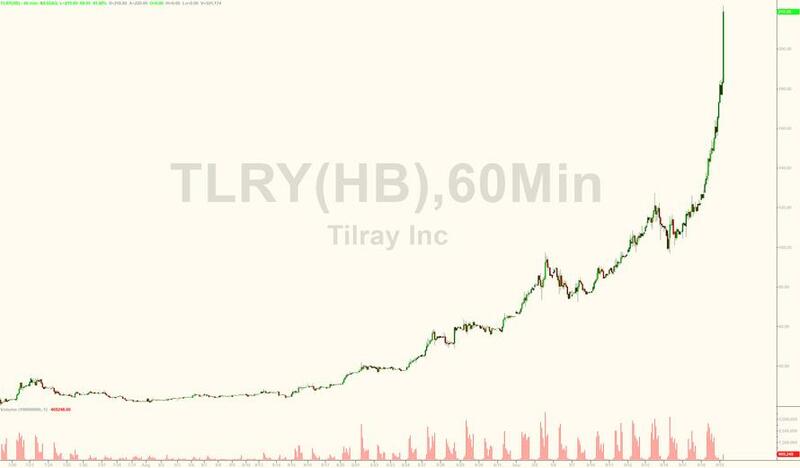 Now, it's all about pot stock Tilray, which is up another 40% on Wednesday morning, soaring to $218 in premarket trading, its third straight day of relentless gains after CEO Brendan Kennedy pithced the company’s growth prospects in an interview with Jim Cramer on Tuesday. And with its market cap north of $20 billion as of this morning, the company's implied value is just over $83 million for each of its 243 employees. Incidentally, the company's most recent revenue was $28 million, or some 714x less than its market cap. Today's spike follows a 29% surge on Tuesday after the company announced the DEA approved plans for it to import medical marijuana to supply a clinical trial in California; until this morning, the stock has gained 42% this week and a whopping 800% since its $17/share IPO in July according to Bloomberg. Kennedy told Cramer that there’s a clear global growth opportunity for medical cannabis and he expects to see another country follow in Canada’s footsteps by legalizing marijuana in the next year. "That’s where the real opportunity is," Kennedy said. “It’s not about Canada. It’s about all the countries that follow." Answering Cramer’s question whether the company plans to sell shares to fund growth, Kennedy said Tilray continually evaluates new sources of capital, although with the stock now well over 10x higher than its IPO price, it is safe to say that an equity offering is imminent. Today's spike took place despite a warning by Cramer that marijuana stocks could fall after Canada’s legalization takes effect next month: "If you are buying it up here, you better have more of a thesis than just that the quarter is good because I think October 17th is not going to be nearly as much as a watershed." Separately, in an interview with Bloomberg, Kennedy said the company is exploring consumer products that include marijuana ingredients and would rather build his business than get acquired by a large consumer company. “I don’t want to get bought by AB-InBev or Diageo, I want to be that company,” he said Tuesday. A key driver behind the surge appears to be a relentless short squeeze, following a bearish report by Citron Research two weeks ago, which prompted many contrarians to short the stock; that bet is now costing them dearly. Should the current appreciation continue, it may eventually put the historic Volkswagen short squeeze to shame.